Watches are among the few fashion accessories that play a big purpose in keeping us aware of the time. While they no longer have the same necessity as they once had, these timepieces make us look good while they tell us the time. However, not all watches are equal. While most watches look the same, they vary in quality on the inside. Because of this, you might wonder which watch you should buy or worth your money. You may also want to know the value of a marvelous watch you just bought so you can share it with your friends. Either way, you want to know the difference between a Casio and a Citizen watch. Every year, Japan’s Good Design Award presents products worthy of their “Good Design Best 100” list. Selected from thousands of Japanese and international firms, Casio and Citizen make the list every year for their integrity, innovation, aesthetics, and ethics in watchmaking. As not all timepieces are created equal, here is a short list of criteria you should look for when buying a watch from them. Customer service is a key issue when buying any product, watches included. Your watchmaker should respond quickly to your inquiries and concerns, including any refunds, exchanges, and warranties. Unfortunately, customer service has declined over the past few decades. Watchmakers are no exception. Both Casio and Citizen have terrible after-sales service. Some customers even complain about not being able to find older watch models. Even with this state of the industry, Citizen tends to have better customer service ratings for their speed and repair quality. Though, Casio is not far behind. The watches are what you want. So, it makes sense that most of your criteria should revolve around them. You want to know which watchmaker has the best timepieces. Customers often praise Citizen for their features such as radio controls, multiple time zones, and water-resistance. However, there is not much of a difference between the watches from either Citizen or Casio. They sync in about the same time and hold the same amounts of charge. Their recharge rates are effectively the same for most people as well. Casio watches are more technologically advance overall though. Casio’s company motto revolves around Creativity and Contribution which is evident in the technology they incorporate into their watches. They make watches that look good with a practical side. Casio watches are not just fashion items. Instead, they fit well in our smartphone-dominated world. Meanwhile, Citizen watches are still more fashion than practical with their low-quality features such as dim glow-in-the-dark hands. Thus, if you want a Casio watch if you want a timepiece that matches your smartphone. Tadao Kashio founded Casio in 1948 as a producer of office devices and calculators. The moved into the watch industry in the 1970s amidst the calculator war of the 1960s. Their first watch, the Casiotron came out of the company’s research into LCI quartz technologies. From then on, the company becomes renowned for their all electronic and affordable watches. Founded in 1918, Citizen Watch began its existence as Shokosha Watch Research Institute. Through its century of existence, Citizen always made watches based on the Swiss technology and ideas of its founders. Both companies are world renown in the watch industry with a lot of experience making timepieces. Therefore, you can be assured that you will always get a great watch if you get it from one of these two companies. You just have to deal with the varying levels of quality and customer service. Casio watch features can vary from model to model because the company designs each watch for a specific market. However, there are a few common features. While nowhere near the capabilities of an Apple Watch, all Casio watches possess some smartwatch features and had such features since the 1980s. The G-Shock, Edifice, and ProTrek lines even support Bluetooth connectivity, simple notifications, and a built-in music player. Many watch models even have GPS signal controls to update the date and time. These smartwatch features include a day/date feature that gives you the current date and time in your location as well in several configurable locations around the world. You can check the day or date This function allows you to view the current day, time and date at a glance. Most Casio models are solar powered. That means you can recharge these watches with any light source without needed to replace the batteries. Because of this, for Casio watches, you never have to worry if your watch has enough power reserve. Because Casio makes watches for the military and the outdoors men, you know that all their models are water resistant as well. However, not every Casio watch has the same resistance. Basic starter models typically have only 100 meters of water resistant. This means they can withstand accident wetting such as in a rain or snow storm, near a sink, or while swimming. The pro models are resistant up to 200 meters for scuba diving. All Casio models have backlit faces. This back-light is either LED’s or Electroencephalogram. In either case, this technology lets you read the watch during nighttime and in low-light environments. Because Casio’s Illuminator technology will light up the entire face of the watch, it is generally better than Citizen’s illumination schemes. All Casio watches feature a stainless-steel case. While not the strongest material in the world, it is very durable, lightweight, and high quality. All Casio watches have a hard resin outer casing for extra durability, as well as shock, scratch, and mud resistance. This resin makes these watches the go-to timepieces for the outdoor lifestyle. Casio watches feature Japanese quartz movement in analog, digital, and hybrid analog-digital confirmations. This helps the timepieces to keep better time. It also provides a display for all the notifications and indicators. As the analog models use solid-state electronic movements underneath, you will always know that these watches are as accurate as possible. Because these watches are digital underneath, they are self-winding and will adjust themselves for daylight saving time. Some watches also offer manual hand winding as well. Citizen syncs its watches to nearby mobile network time towers. This feature provides ultra-precision to their timepieces with the exact time. Citizen’s Eco-Drive recharges your watch from a natural or artificial light source, making it very eco-friendly. The energy is then stored in a rechargeable lithium-ion cell. This removes the need to replace the batteries. Plus, Citizen watches can run off the battery for months. So, you will always have a working watch even in the darkest situations. You can also find a wide range of water-resistant Citizen watches. They are decent timepieces for water sports and pro marine activities. However, unlike Casio, you cannot use Citizen watches while scuba diving. In conjunction with the atomic timekeeping, Citizen watches offer accurate date and time information for multiple time zones. You can even do multiple time zones in some models, which is perfect for those that travel a lot. Citizen watches are among the most durable and strongest timepieces on the market with their titanium cases. They are noticeably more durable than watches made with stainless steel. While not all Citizen watches have titanium, but many models offer it as their key feature. Citizen watches offer anti-reflective sapphire crystal finishes. For most people, this is comparable to a hard resin for scratch-resistance. So, unless you live for the outdoors, you should be fine with the extra protection sapphire crystal provides. Most Citizen watches come with a perpetual calendar. This feature “knows” the date, including the day, month, and year, and will automatically reset on the first day of the month. It will even keep the precise time and date during the irregular months such as February and leap years. However, it does not do daylight saving time. So, you will have to adjust your watch twice a year. You only have to move the time on hour forward or backwards, but all Casio watches will do this for you. Citizen’s automatic watches do not require batteries. They are powered by your arm movements with a reserve charge that can last up to 50 hours. Because of this, these watches often feature an indicator that shows how much charge is still in the watch. Founded in 1946, Casio has always been a digital company, and it shows throughout their watch selection. Each Casio watch features technology developed over the years for calculators going all the way back to the world’s first electromechanical calculator from 1949. The company even developed the quartz movements that all watches use this day. Because of this rich history, Casio watches are workhorses. The company designs each timepiece for a particular market, and their watches are often the best performing watches for those markets Need a watch for your hike in the woods. Casio has a watch that will get you there. Need a watch that can withstand a firefight? Casio has a watch for you. Their watches just work whenever and wherever. While not as robust as titanium watches, the stainless-steel cases with resin coatings make of very durable timepieces that can take a licking and keep on going. NASA astronauts even wear their Casio watches in space. Despite this, Casio battery performance is akin to a Jekyll and Hyde act. Using the dual-layer screen as a regular Android Wear, you will get the same level of performance if you use all the indicators and various settings. You can expect the battery to last a day under this load. You can turn off the always-on display to save the battery. In this mode, a Casio watch will last two days without needing a recharge. Though, you can also choose a hybrid setting where the watch till display some notifications in the background. In this mode, you will see a 9-hour performance if you prioritize data over the battery and 25 hours the other way around. At a century old, Citizen offers many famous watch brands throughout the world with such features as Eco-Drive, quartz, and mechanical movements. The company does not stop developing and innovating their timepieces either. They already created watches with voice controls. The company has been constantly improving and expanding its product lines since it was founded, including slimmer LCD displays, and diving watches with electronic depth sensors. These features allowed Citizen to rise to the top and lead the industry. Citizen watches even have a bezel you can use to calculate conversions for speed, time, and distance. Their technology is so innovative that the US Open chose them as their official timekeeper, among their other sports competition sponsorships such as the World Figure Skating Championship. With this review of Casio and Citizen, we discussed two of the top watch brands in the market with high-quality timepieces that are worth considering. While both companies are well established, Citizen has been in the industry for 30 years longer than Casio. Which company offers the “better” watches? The answer to that will depend on what you need in a watch. Casio watches are more niche than the ones from Citizen, but otherwise, both watchmakers make watches that are nearly the same in overall quality. If you want aesthetics, Citizen has you covered. If you need a watch with features that will get you through that long trek through the countryside, a Casio will fill your needs. Casio is also the better choice if you need smartwatch capabilities. Casio watches are compatible with Android Wear and will sync with any Android phone or mobile device. However, Citizen is better at providing more traditional high-end watch functions for your diving and travelling excursions. 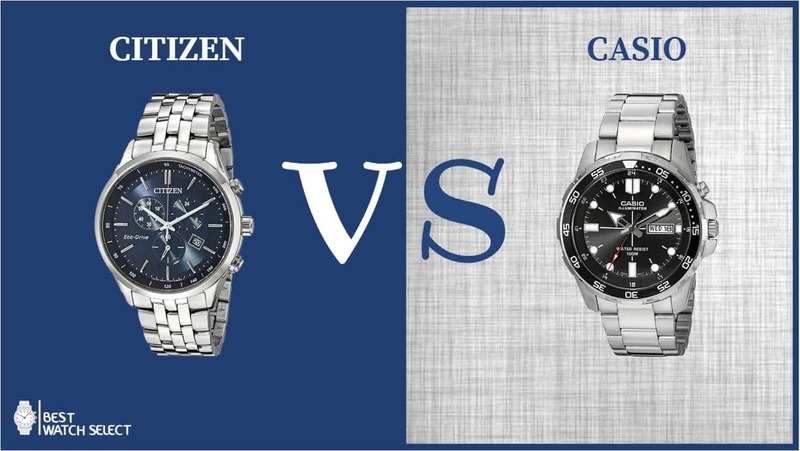 In the end, the choice between Casio vs Citizen comes down to personal preference. You should first decide what you need in your watch and look for something that offers those features. Only then, you can find the best watch for you. All I know about wristwatches isn't by chance. It takes persistence and diligence to become a horologist. I'm so passionate about watches which is the reason I choose to share my experience with like-minded people. © 2019 Best Watch Select. | BestWatchSelect.com is a participant in the Amazon Services LLC Associates Program, an affiliate advertising program designed to provide a means for sites to earn advertising fees by advertising & linking to Amazon.com.